Kids see many community helpers every day, but we rarely stop to talk about what they do. These bubble maps will give you that opportunity! 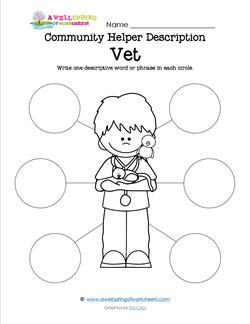 Choose a community helper (or a few) and brainstorm with your kids what they think the helper does. 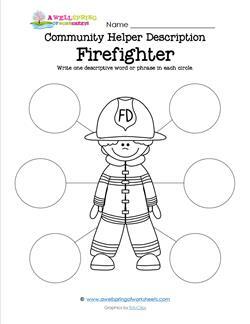 Fill in the six bubbles on the community helpers job descriptions worksheet using one word or a short phrase of what they actually do. For example, a chef chops, cooks, bakes, stirs, measures, and pours. Have fun! 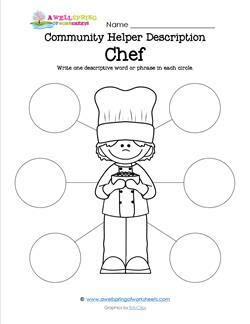 This community helper sometimes wears a tall white hat, he or she cooks food, usually good food, mixes ingredients together ... who is he? A chef! 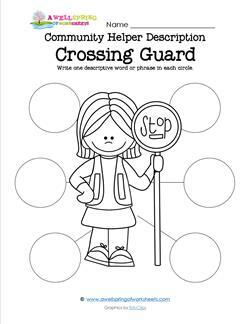 This community helper makes sure traffic is clear, walks into the crosswalk, holds up a stop sign and crosses children safely ... who is she? A crossing guard! 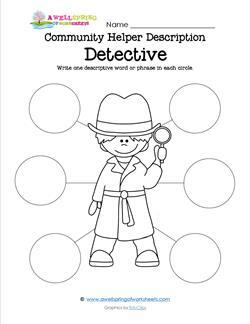 This community helper gathers clues like fingerprints & people's stories & puts them together to try to solve a problem or a crime ... who is he? A detective! 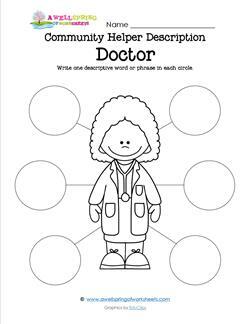 This community helper listens to your heart, asks questions about your health, and gives you medicine when you're sick ... who is she? A doctor! 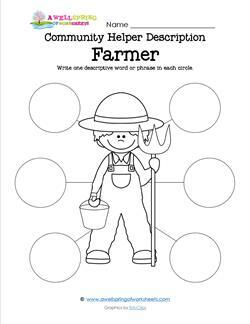 This community helper gets up early in the morning, feeds the chickens, milks the cows, drives a tractor, & takes care of the crops ... who is he? A farmer! 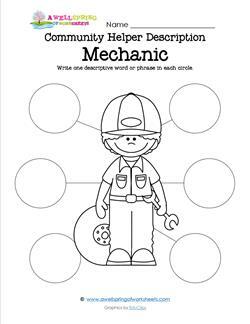 This community helper wears yellow protective pants and a jacket, a helmet, drives in a big red engine, and helps put fires out ... who is he? A firefighter! 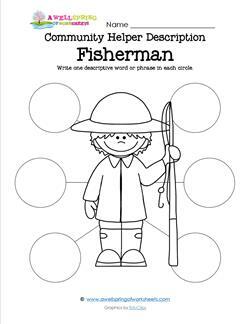 This community helper works on a boat, casts a fishing rod or a big net into the water in hopes of catching something good to eat .. who is he? A fisherman! 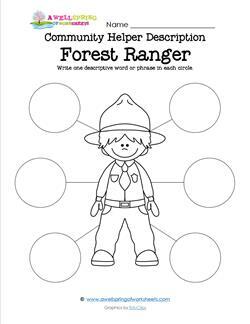 This community helper works where there are lots of trees, tells people about the great outdoors, and leads people on trails ... who is he? A forest ranger! 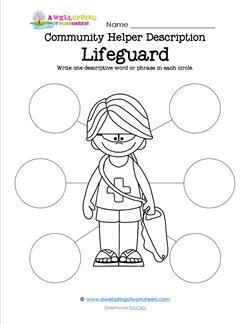 This community helper works at a pool or a beach, wears a bathing suit, and watches to make sure people are safe in the water ... who is he? A lifeguard! 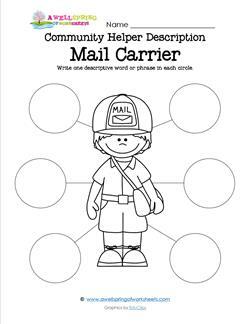 This community helper wears a blue uniform, walks or drives a truck, and delivers things to your house every day (except Sunday) ... who is he? A mail carrier. This community helper gets his hands really dirty, uses tools, takes off old parts and puts new ones on, and makes things run better ... who is he? A mechanic! 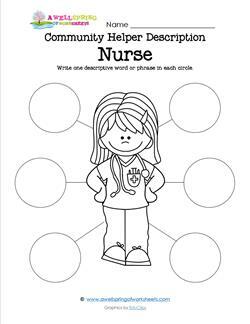 This community helper works in a hospital or office, takes your temperature, asks you how you feel, and helps you to get better ... who is she? A nurse! 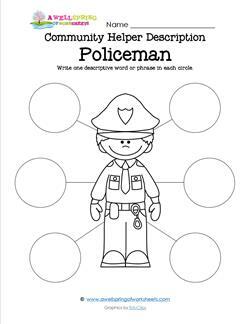 This community helper wears a uniform, drives a car or a motorcycle, can face dangerous situations, and works to keep us safe ... who is he? A policeman. 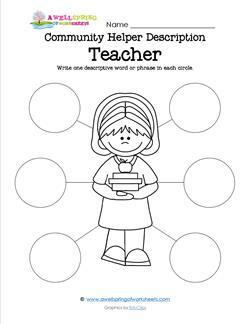 This community helper spends most of the day with kids, reads to you and with you, gives you assignments, plans fun things for you to do ... who is she? A teacher! 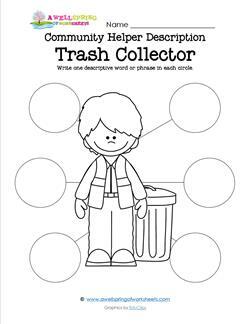 This community helper drives in a big noisy truck, works with smelly & dirty things, does a lot of lifting, & takes things away ... who is he? A trash collector! This community helper works in an office with animals all day, looks them over really well, takes their temperature, and gives medicine to make them better ... who is he? A vet! 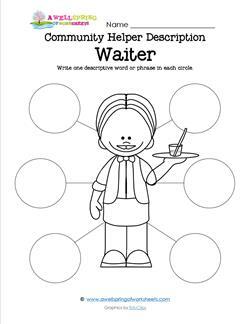 This community helper works in a place where you eat, he takes your order, serves you food & drinks, & gives you a bill before you leave ... who is he? A waiter! 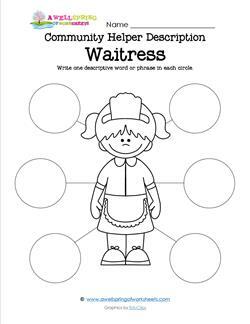 This community helper works in a place where you eat, she takes your order, serves you food & drinks, & gives you a bill before you leave ... who is she? A waitress!